Intense pulsed light or IPL is a non-invasive and non-ablative treatment that uses high intensity pulses of visible light to improve the appearance of the skin, treat specific skin concerns and remove hair. It targets the lower layers of skin (dermis) without affecting the top layers of skin (epidermis). IPL works on the same principles as lasers. Light energy can target specific types of tissue in the skin using varying colour wavelengths. These are converted to heat energy which causes a very controlled response exactly where it is required. Penetration and effectiveness is further enhanced with our Ellipse system of filters enabling very specific targeting with minimum energy giving superior results with less pain and downtime.  The staff at Westend Beauty Clinic Sligo are specifically trained in the use of the Ellipse machine in combination with IPL/laser safety and technology. They have chosen this machine because of its proven results, research, reliability and safety. Most skin concerns receive optimal results with fewer treatments when combined with appropriate at home skin care. Your skin advisor at Westend Beauty will discuss this with you at your IPL consultation. 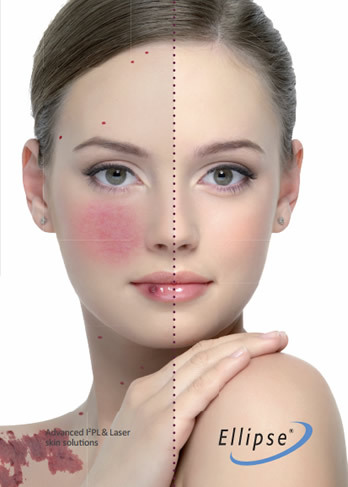 How much time is each Ellipse IPL treatment? Many hairs can be targeted in one flash of light. Treatment of the upper lip takes approximately 5 minutes, whereas a back or both legs take 20- 30 minutes. 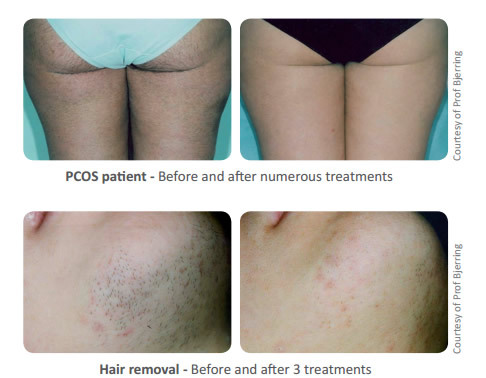 It is important not to pluck, tweeze, wax or use hair removal creams during the four weeks before treatment. This ensures that as many hair follicles as possible contain a hair which can be destroyed. It is also important to avoid tanning (sun, solarium or self-tanning products) before and during the treatment period. Otherwise your tanned skin will absorb the light instead of your hair. It is also recommended to use sunscreen (min. SPF 30) for four weeks following treatment. While tolerance of pain is very individual, no anaesthetics are required, and most people describe the sensation as practically pain-free, like that of a rubber band snapping onto the skin. Clinical trials documenting Ellipse’s safety and effectiveness were carried out by leading doctors prior to the release of the machine, and it has been in daily use for over 15 years, with – uniquely – a 10-year follow-up study showing long lasting results. You are view the scientific papers on the Ellipse website at www.ellipse.com. 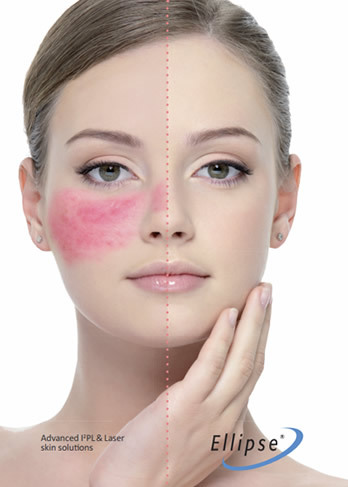 Rosacea can be irritating. Other people do not notice the diffuse redness on your face, or the small blood vessels (called telangiectasias) as much as you do. Your skin consultant can assist you with lifestyle factors and skin care products to help avoid the flushing and strengthen your skin. 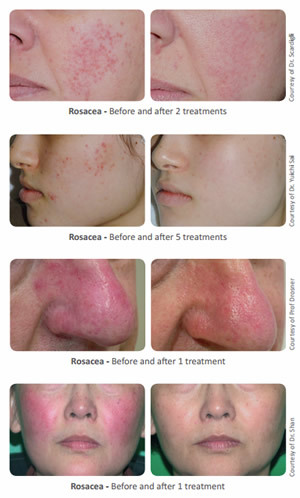 Ellipse IPL treatment can also be an effective tool in reducing the symptoms. For optimal results, we suggest applying a cooling post treatment gel morning and night for 48 hours and having a at home skin care regime. This will be discussed at your treatment consultation and recommendations will be made. It is essential that you avoid sun exposure for 30 days, even if there is no sign of inflammation in the treated area with a good quality physical sunblock product. No anaesthetics are required, and many patients describe the treatment as practically pain-free, like a flick from a rubber band followed by a sensation like the feeling of gentle warmth after a day on the beach. Vascular lesions are the result of numerous or large vessels that form directly underneath your skin. These lesions occur in many sizes, shapes and can be found all over the body. They occur in a variety of forms including port wine stains, broken capillaries, diffuse redness, hemangiomas and cherry angiomas. You no longer need to accept them as a price for growing older or as an accident of birth. Many different problems can be treated. 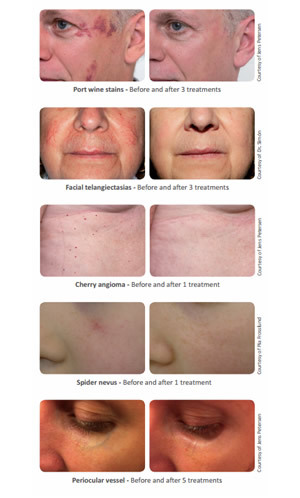 Treatments are most efficient in patients with light skin who are not suntanned at the time of the treatment. If your skin is less tanned, the contrast between the blood vessels and background colour of the skin is greater, making treatment easier. However, Ellipse has pre-programmed settings for different skin types that deliver the correct energy output for your complexion. It is, important to avoid tanning (sun, solarium or self tanning products) before and during the treatment period. Otherwise your tanned skin will absorb more light, which makes treatment less effective and less comfortable. It is also a good idea to avoid smoking in the 4 hours prior to treatment. No anaesthetics are required, and many patients describe the treatment as being like a flick from a rubber band followed by a sensation like the feeling of gentle warmth after a day on the beach.